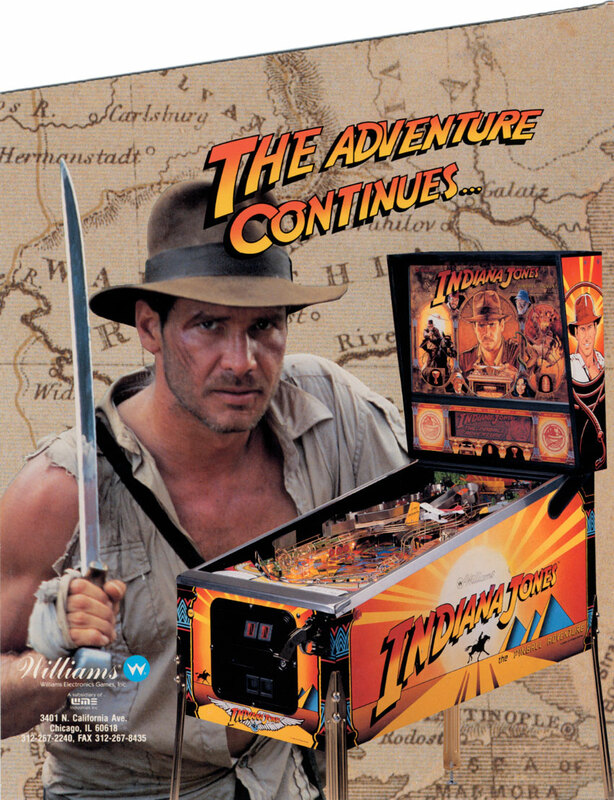 DIY Indiana Jones pinball table….sorta! This afternoon I’ve been thinking a lot about that Indiana Jones Pinball table I happened to come across in Llandudno during my travels last week (see blog post (https://stiggyblog.wordpress.com/2012/08/14/snowdon-camping/ ) and how it would be nice to play it again. Sadly, that’s quite a long drive just to play it again! I also got to thinking about all those DIY pinball machines that folk have built using LCD screens and PC components and thought it would be fun to built a small scaled down desktop pinball table. Similar to my DIY mini-Mame cabinet project , I thought I’d once again build it around my Acer Netbook tablet and go from there. 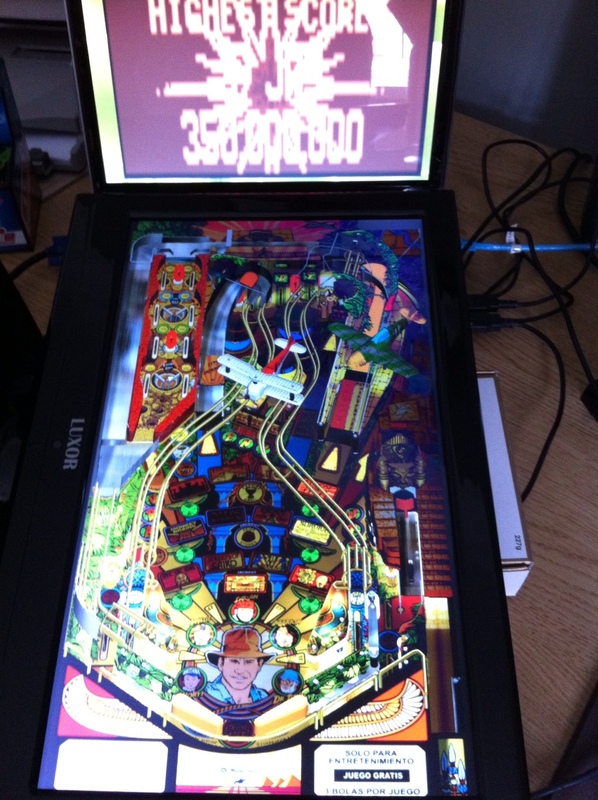 I’ve not really used Visual Pinball before so what I wanted to do today was familiarise myself with how it works and also to see if my netbook was up to the task – bearing in mind of it’s low graphics capabilities. First up, headed on over to http://www.vpforums.org/ to register for an account and to read the tutorials that explain how to setup Visual Pinball and to download the required files. Cuppa and a little light reading whilst backing up my photos to my NAS – prompted by a conversation with a colleague at work who lost her precious photos due to harddrive failure and realised it’s been a while since i’ve done a backup myself! 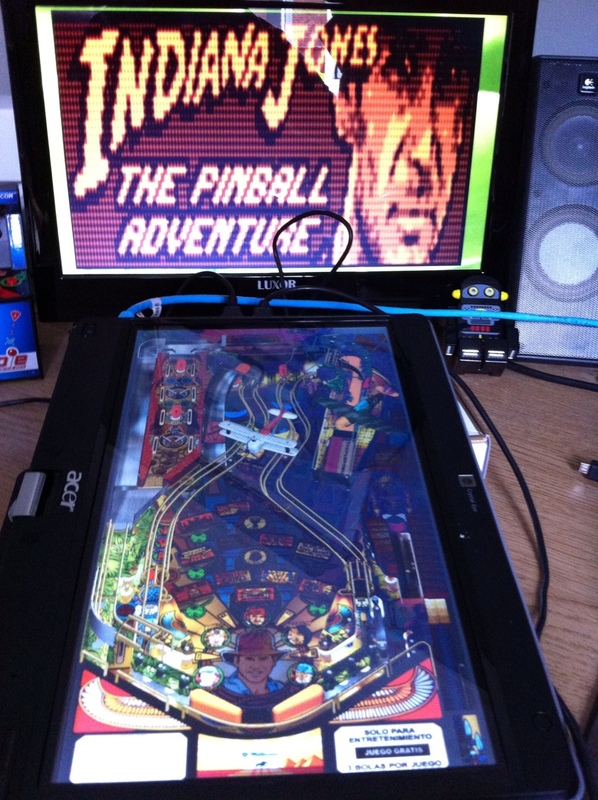 With the VP software installed and setup, I downloaded the Indiana Jones Pinball adventure table (FS) and ROM file. I’ve connecting my LCD TV via a VGA cable to extend my Windows desktop and have launched PinMame to have a play around with the dot matrix back board display. Now for the fun bit. 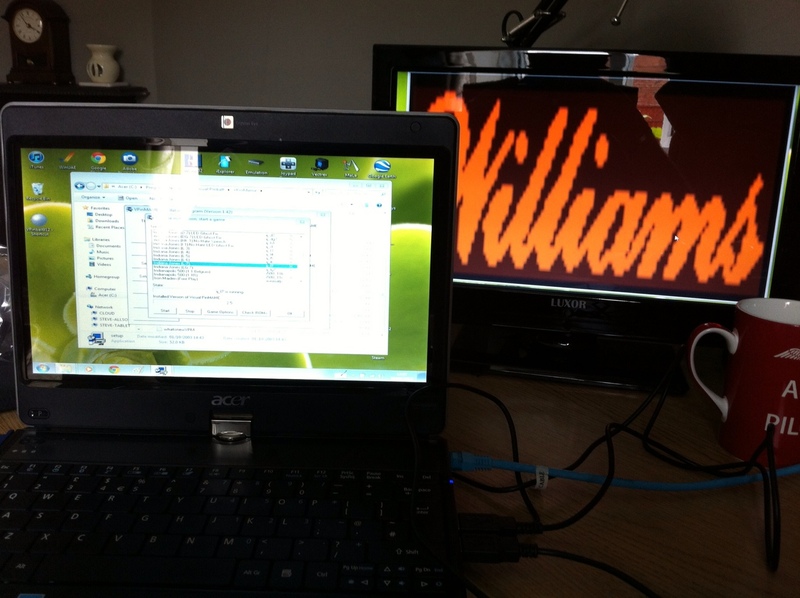 With the dotmatrix display in a separate window and dragged over to my TV screen I launched VP with the Indiana Jones table on my netbook, rotated and screen flipped so that it was in tablet mode. With the netbook in tablet mode I didn’t have a keyboard so I couldn’t play the game….but that didn’t matter I was over the moon to have it running in attract mode. ……of course that lasted until i’d finished my cuppa! I wanna play this thing! Grabbing my USB joypad I mapped a couple of buttons for the left/right flippers, coin insert and start button. I also thought it might be fun to project the table on to the TV screen instead as this was a large screen than my netbook. I had to mess around with the desktop orientation and screen resolution but I got it working after a while. I spent the rest of the afternoon messing around with a few other classic tables like The Black Hole, Addams Family and Creature from the Black Lagoon. Now to the drawing board to think about plans for the wood work. I’m also toying with the idea of fitting a 7″ TFT screen for the back board. Flipper buttons will be controlled via iPac and I have a few ideas for a working pinball plunger. Here’s a quick video of this afternoons basic setup. This entry was posted in Arcade, My Tech, Retro Gaming, Retro PC Gaming and tagged indiana jones, Pinball, retro gaming, visual pinball. Bookmark the permalink. I ran the arcade at the end of Llandudno Pier back in the 1990s and Indiana Jones was there then! There was also a Funhouse pinball there at that time, loved playing that one. Amazing to think Indy is still there all these years later.